The hassle-free latches on this hitch-mounted tow bar let you easily release your car, even at a hard angle or on unlevel ground. Stainless steel, telescoping arms and large hookup radius make connecting a snap. Easily folds up to store on your RV. 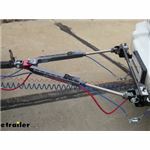 Lowest Prices for the best tow bars from Roadmaster. 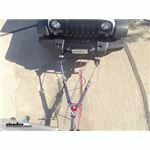 Roadmaster BlackHawk 2 All Terrain, Non-Binding Tow Bar - Motorhome Mount - 2" Hitch - 10K part number RM-422 can be ordered online at etrailer.com or call 800-298-8924 for expert service. This Roadmaster tow bar has a large hookup radius to ensure simple, secure hookup. What this means is that, even if your towed car is not perfectly aligned with your RV, you will still be able to make the necessary connections. To achieve this, the BlackHawk 2 has stainless steel, telescopic inner arms that adjust independently. In addition, these arms are able to pivot in and out, changing the spread. So, if your car is angled a bit behind your RV, you'll still be able to hook up by bringing the arms closer together and staggering the length so that 1 arm is longer than the other, allowing it to reach the more distant base plate. The fact that the arms are extra-long also allows for a better turning radius. By putting more distance between your motorhome and your towed car, your entire setup will become easier to maneuver so that your towed car will track behind your motorhome without running the risk of hitting your RV during turns. When using EZ, EZ2, EZ4, XL, or Classic base plates, quick-disconnects make it a snap to attach the tow bar to your vehicle. Other methods require you to maneuver each tow bar arm individually and perfectly line up tabs on the arms with tabs on your base plates. Roadmaster's unique design lets you connect and disconnect the tow bar quickly and easily, all by yourself. The quick-disconnect brackets come in separate pieces. The pieces that are positioned on the ends of each tow bar arm interlock with matching brackets that attach to your Roadmaster base plates. Sandwiched between the tow bar arms is a sturdy crossbar that essentially turns the arms into a single structure. This crossbar allows you to lower the tow bar as a single piece onto the quick-disconnect brackets on your towed car so that you don't have to connect each arm separately. When lowering the tow bar onto the brackets, make sure that the tab on each bracket lines up with the hole in the matching bracket. Then just insert the linch pins through the holes in the tabs on top to secure the brackets together. To remove the tow bar, simply remove the pins and lift the tow bar off of the brackets. These convenient brackets also make it simple to mount any number of Roadmaster accessories, from basic safety cables to the Guardian rock shield. If you have MS, MX, or EZ5 base plates, the arms will connect directly to the base plates. Just remove the quick-disconnect brackets from the ends of the arms and you will be left with lugs that fit into the base plate brackets. Once the lugs are set inside of the brackets, simply insert the included pins to secure them in place. The Freedom Latch makes disconnecting this tow bar a breeze. This latch makes it easy to release the tension that can build up in a telescoping arm when the RV and towed car are not perfectly lined up. Just flip the latch to release the pressure, and the arms will be able to telescope freely, making it easy to disconnect the tow bar from the base plates. This allows you to disconnect even when you're at a hard angle or out of level. This BlackHawk 2 All-Terrain tow bar has been subjected to rigorous physical and computerized testing to ensure that it meets Roadmaster's exceptionally high standards. Throughout the design process, Finite Elemental Analysis (FEA) is done. Each of these tests display a 3-dimensional image of the tow bar while it is put under thousands of pounds of pressure. Areas of stress in the tow bar can then be located and studied so that those areas can be strengthened. This process is repeated until any weak spots, particularly those found in load-bearing components, are completely removed. The result is a durable, strong, and safe product. The BlackHawk 2 All Terrain can easily be folded up and stored on the back of your RV when not in use. After disconnecting the tow bar from your towed vehicle, push the arms of the tow bar together so that they are side by side. Fold the tow bar up toward the RV and the storage latch will automatically lock it in place. Flat towing your vehicle is much more convenient than using a trailer or a tow dolly. These other options take up much more storage space, leaving you less room both at home and at the campsite. In addition, securing your vehicle to a trailer or tow dolly can be a hassle and more time consuming than hooking up with a tow bar. There are 5 basic components needed when flat towing a vehicle: a tow bar, a base plate kit, a safety cable set, tow bar wiring, and a supplemental braking system. The tow bar links your towed car to your motorhome. It attaches to the custom-fit base plates that install on the frame of your towed car. Safety cables ensure that your towed car does not separate from your motorhome in the event that your tow bar becomes detached. Tow bar wiring allows your towed vehicle's signal lights to sync up with your motorhome's tail lights, which is required by law in most states. Finally, the supplemental braking system - also required in most states - brakes your towed car when the brakes in your motorhome are activated, preventing wear on the motorhome and decreasing braking distance for your entire setup. 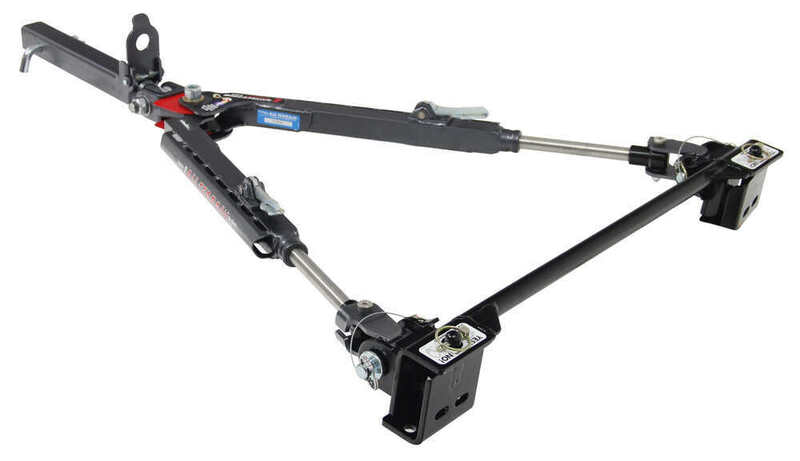 This hitch-mounted, self-aligning tow bar has independent arms with trigger releases that make it easy to connect and disconnect, even on unlevel ground. Built-in rise/drop minimizes need for a high-low adapter. Stores neatly against your RV. This sleek, aluminum tow bar is designed for use with MX, MS, and EZ5 base plates. LEDs line the arms for maximum visibility. A large hookup radius and hassle-free latches make it easy to connect and release. Safety cables and wiring included. Today we're going to review part number R-M-4422. This is the Roadmaster Blackhawk two all-terrain tow bar. This tow bar has a 10,000 weight capacity. This tow bar will allow you to safely and effectively tow your vehicle behind your RV. Basically these quick disconnects will be attached to your vehicle. This would attach to the it's a hitch mount tow bar. It'd attach to the hitch of your RV or motorhome. This is the all-terrain model. It features the freedom latch, which is these latches on each arm here for quick and easy disconnect in any environment. Basically this will allow you to disconnect the first time, every time by releasing your car even when it's at a hard angle or out of level with the tow bar. There's no more binding of one of the arms. The telescoping arms will hook up with ease and automatically center and lock as you drive ahead preventing sway and making hookup quick and easy. If you'll notice on the side of each one of these arms, there is a built-in cable guide which will protect the wires like electrical wires and your safety cables from getting damage from hanging down or getting tangled. It enhances the look of your tow bar. This tow bar has a dropped forged steel yoke, has the super weld steel alloy arms to provide superior strength. It does have the quick disconnect system which lets you quickly and easily mount and remove the tow bar on your own. This tow bar is large enough that it can tow a lot of your full-size vehicles like the Surburbans, the Hummers, the Excursions. This part is made in the USA. On this quick disconnect system, I just want to show you basically what you'll do is to disconnect it from your car; you just pull out the pin. You'll see this is the quick disconnect that is attached to the base plate of your vehicle. We'll do the same over here. You can see the quick disconnect comes off. This straight base assembly is still on there. You can leave this on the tow bar if you want or you can leave it on the car. If you get into your camping spot and you just want to disconnect the whole thing, what you can end up doing is leave the disconnects and the tow bar assembly attached. What you can do is just disconnect the arms of the tow bar. If we pull that pin out; and then the same way over here if you pull this pin just like that and this tow bar assembly you could actually leave hooked to these quick disconnects on your vehicle. If you just want to store your arms, what you could do is you go ahead and push these in just like that; slides in very easily. You might want to just compress them together. What you want to do is go to the end here. You'll notice there's this latch that's sticking up. This is your storage latch. This will automatically lock this tow bar in place when you fold it up toward your RV or motorhome provides a effortless and secure storage. Basically this part right here would be on your RV or motorhome. What you want to do is just go ahead and fold this right up. You'll notice as you push it, that will lock onto that big allen bolt head right here. It keeps this up against your RV or motorhome. When you go to attach it, you just pull this down, pull the latch down and then push down on it. You can lower your arm back down and hook it up to your quick disconnect assembly; very quick and easy operation. This does come with a one year limited warranty. This tow bar does work with all your Roadmaster vehicle-specific base plates like the E-Z model, the E-Z two, the M-S, the M-X, X-L, and the standard. That should do it for the review on part number R-M-422, the Roadmaster Blackhawk two all-terrain tow bar. .
Order: RelevanceNewestRating - High to LowRating - Low to High The hassle-free latches on this hitch-mounted tow bar let you easily release your car, even at a hard angle or on unlevel ground. 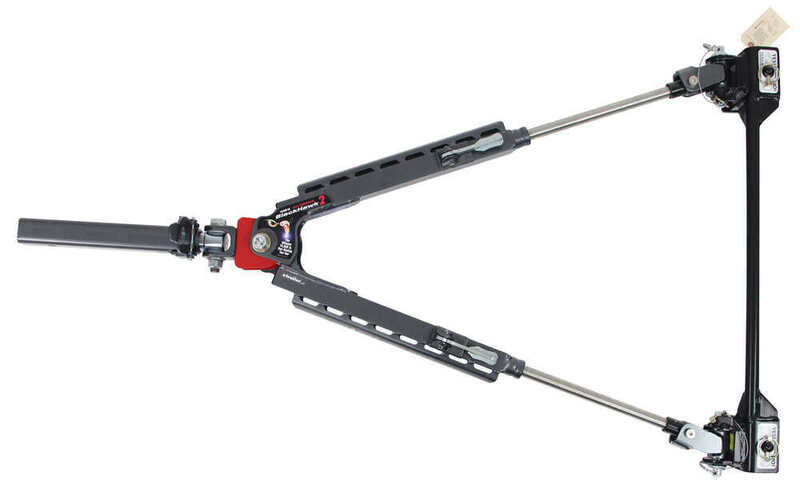 Stainless steel, telescoping arms and large hookup radius make connecting a snap. Easily folds up to store on your RV. This hitch is so easy to hook and unhook when I fell ill my wife absolutely had no problem getting the car hooked back up and getting us back on the road. Do you have a question about this Tow Bar? Highest quality tow bars for the best price. Most detailed, accurate tow bar information available.